James Lovegrove’s Age of Shiva, the end of the Pantheon series! It’s sold more than 150,000 copies worldwide since 2009 and spawned its own genre of ‘Godpunk’; now the best-selling Pantheon series draws to a close with James Lovegrove’s Age of Shiva! The latest stand-alone title in this action-packed military SF series brings you a world where the multitude of Hindu gods hold sway and a simple comic book artist finds himself trapped in the middle! Zachary Bramwell, better known as the comics artist Zak Zap, is pushing forty and wondering why his life isn’t as exciting as the lives of the superheroes he draws. Then he’s shanghaied by black-suited goons and flown to Mount Meru, a vast complex built atop an island in the Maldives. There, Zak meets a trio of billionaire businessmen who put him to work designing costumes for a team of godlike super-powered beings based on the ten avatars of Vishnu from Hindu mythology. The Ten Avatars battle demons and aliens and seem to be the saviours of a world teetering on collapse. But their presence is itself a harbinger of apocalypse. The Vedic “fourth age” of civilisation, Kali Yuga, is coming to an end, and Zak has a ringside seat for the final, all-out war that threatens the destruction of Earth. 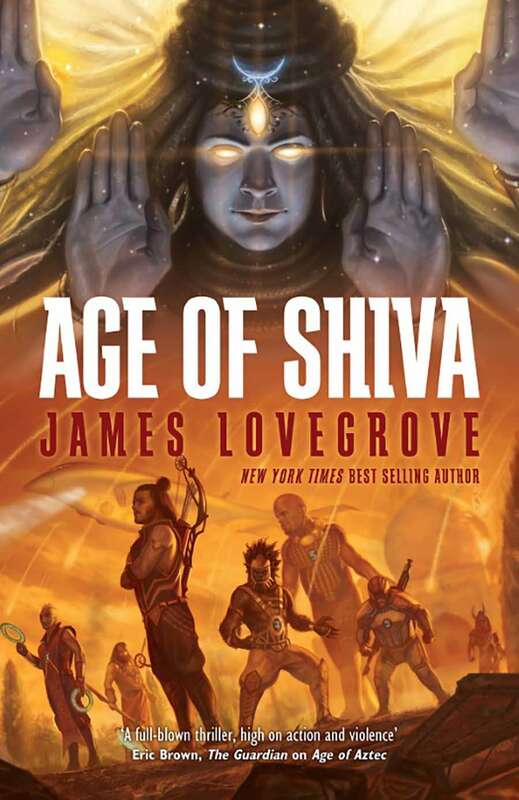 James Lovegrove’s Age of Shiva will be available in eBook and Print formats in March! A thematic series of related, but stand-alone novels, the Pantheon series addresses the theme of “men versus the gods” in different worlds, with different pantheons, offering different takes. All high-action military SF books, the series has presented an armed uprising against distant but powerful Egyptian divinities, a high-powered slugfest between battle-suited humans and super-heroic Greek gods, and a gritty, intimate firefight between an infantry company and an army of ancient Norse giants. James Lovegrove published his first novel at the age of 24 and has since had more than 40 books out, including The Hope, Escardy Gap (co-written with Peter Crowther), Days, The Foreigners, How The Other Half Lives, Untied Kingdom, Worldstorm, Gig and Provender Gleed. His short fiction has appeared in magazines as diverse as Interzone and Nature and in numerous anthologies. He has written extensively for reluctant readers, with titles such as Wings, The House of Lazarus, Ant God, Cold Keep, Kill Swap and Dead Brigade. He has also produced a sequence of teen fantasy novels, the Clouded World series, under the pseudonym Jay Amory. He is a regular reviewer of fiction for the Financial Times and lives in Eastbourne on the south coast of England with his wife Lou, sons Monty and Theo, and cat Ozzy.